Quality Handyman Services From Alure Home Improvements! Let’s face it. There are plenty of jobs and tasks around the house to do that you either don’t have time for or, honestly, don’t know how to do it. So let us do it! We implemented the Alure Handyman Services for that exact reason. Not only do we want to help you with your remodeling needs but we can take care of the smaller day-to-day home improvement tasks as well. There is no job too small, literally! Take a glimpse at some of the handyman services Alure Home Improvements can help you out with. You don’t necessarily need to completely re-do your entire kitchen to make it look like new. By adding a fresh quartz or granite counter top to your kitchen you can make it look outstanding! We have the professionals on staff that can install it for a perfect fit. Are the walls in your house starting to look like Swiss cheese from all of the holes you’ve put in it trying to hang pictures over the years? New sheet rock is the perfect way to make those warped walls smooth, crisp and clean! If you’ve had the same floor since the last time the Islanders won the Stanley Cup, then its probably looking a bit outdated. There are thousands of different designs that could give your home the perfect look you’ve been searching for. From mixing the mortar to grouting the last block, we can handle any floor in your home, from bathroom tile to kitchen tile, to more. 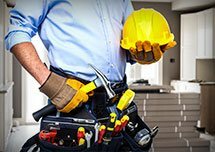 These are only a few of the types of handyman services we offer Alure. If you have something you’ve been putting off on your to-do list, give us a call and let us do it!